Homemade fixture plates for mini mill accessories. Fabricated from 6061 bar stock. Plates are drilled and tapped on a 1" grid pattern. 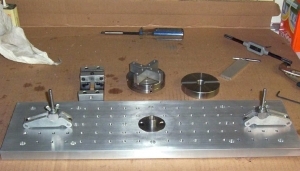 Mounted on the mill with T-nuts and SHCS.